Since I’m a lover of all things bacon (read the history of bacon) I just had to share this 1964 “before it’s time” product by Reddi-wip. 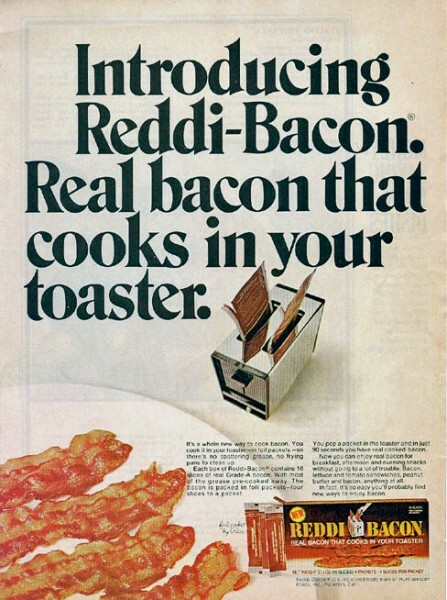 Reddi-Bacon was pre-cooked bacon packaged with an absorbent paper pad between sheets of foil. The packets – each containing four slices of bacon – were designed to be inserted into standard household toasters. In just 90 seconds, one could chomp down on salty deliciousness. Unfortunately, package leaking became a concern. Since it was possible for some excess fat to drip, many saw the product as a fire hazard (as well as a potential toaster-killer). Despite patent filing and a marketing campaign, Reddi-Bacon never completed its test markets, and the product was pulled. While many resources (including CNN) have since labeled Reddi-Bacon as a dumb idea, I have to give Reddi-wip two thumbs up for thinking outside the box, even though it would be much later before their idea reached full fruition… for our microwaves. I take my bacon seriously. My cooking method of choice is with an old electric skillet. But, hey, if I’m in a hurry and am craving one of my favorite snacks, I’d totally go for tossing a metal packet in the toaster or toaster oven. I’d think the result would be a crispier treat with better flavor than I’d get from the microwave. Oh, to have been a home tester of a product like Reddi-Bacon. I would have gladly sacrificed a toaster or two. With fire extinguisher nearby, of course.